Staybridge Suites Welcomes You for an Extended Stay at Tampa Sabal Park Hotel Ideally situated just over ten miles from downtown, the Staybridge Suites hotel of Tampa, Florida is in close proximity to the Tampa International Airport (TPA). Our hotel is also located near prominent businesses, as well as many area attractions. This pet friendly Tampa extended stay hotel offers easy access to downtown shopping and attractions. If you're traveling with your family, Top Golf is just 2 miles away, and the Florida State Fairgrounds are around the corner. Nearby Busch Gardens & Adventure Island Theme Park are also a great place to take your entire family. Business travelers appreciate our hotel's Tampa location, as it is near prominent businesses such as Ford Credit, Amazon, USAA, Citigroup, Progressive, and JP Morgan. For added convenience, our Tampa hotel offers a 24-hour business center and four meeting rooms that can accommodate up to 65 people for your professional needs.Guests can enjoy the convenience of choosing between studio, one and two bedroom suites at our hotel in Tampa, Florida. They will enjoy the community feeling they'll experience at our hotel, with great amenities including a 24-hour fitness center, anoutdoor pool, a convenience store and complimentary laundry facilities. 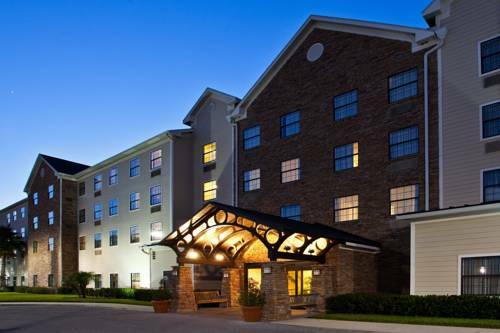 Call today for a great hotel deal and rate in Tampa, Florida at the Staybridge Suites.